It’s wonderful to see the Sligo Food Trail brand gathering momentum with media at home and abroad. Expedia is the latest high profile website to feature it in several different sections. 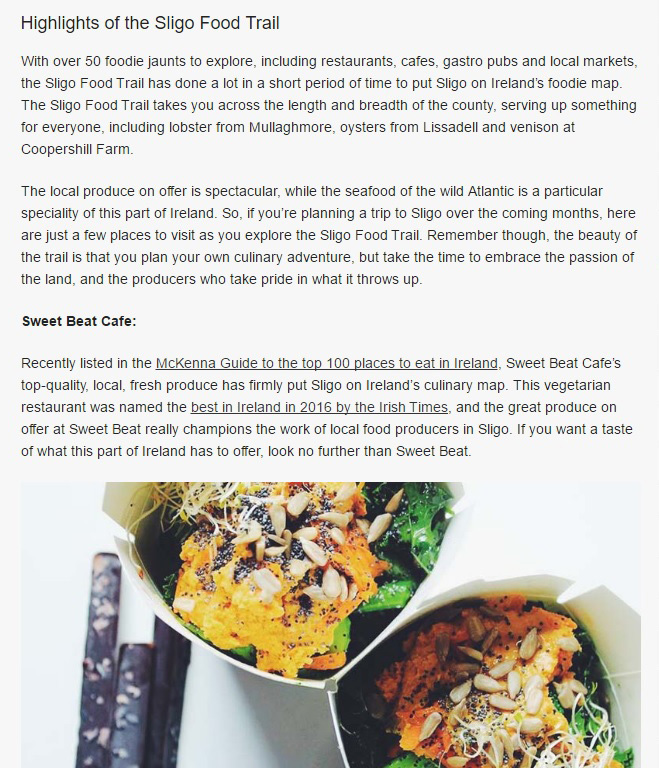 Sligo Food Trail is featured on a new Expedia website showcasing some of the best driving holidays in Ireland). The food trail was one of the recommended activities on the Surf Coast leg of the Wild Atlantic Way. Additionally we have our own Sligo Food Trail listing. Expedia, Inc. is an American travel company that owns and operates several international global online travel brands, including Expedia.com, Hotels.com and trivago. The company operates more than 200 travel booking websites in more than 75 countries. Media coverage of the Sligo Food Trail is increasing month on month and the feedback and interaction we are receiving is fantastic. Don’t forget to check out the Sligo Champion each week for the latest in the Faces of the Sligo Food Trail series.